The Japan Aerospace Exploration Agency (JAXA) created space bullets to fire asteroids to prevent their debris from falling to Earth. This was reported by the journal Nacked Science. The test was conducted in a vacuum chamber on a copy of the Rugu asteroid, recreated by scientists for the sake of experiment. "The test focused on two main points. The team wanted to be sure that the copy of the tool was still working after the downtime that lasted from December 2014 - from the moment Hayabus-2 was launched. One of the discoveries was also investigated during the tests. device: upon closer inspection, the probe “saw” that the surface of Ryugu was covered with gravel, rather than fine dust, the presence of which suggested JAXA when developing the mission, ”the report said. So, scientists imitated the gravel structure of Ryugu and the chemical composition of the meteorite class, which, in their opinion, originate from similar asteroids. The researchers placed the entire apparatus in a vacuum chamber to better simulate the conditions on the asteroid (although they still had to work in earth gravity). According to scientists, the test was successful, they were able to confirm that the bullet mechanism actually created the samples that the device could collect. The boat was named Good Ship IKEA. The company Ikea has developed a remote-controlled boat designed to clean the rivers. This writes the Chronicle. Info with reference to pop mech. As noted, it was modeled on the basis of toys for the bathroom SMÅKRYP, but it has great functionality. It uses a special technology that allows you to collect up to 20 kilograms of garbage: with this in mind, we can assume that a small group of such boats could keep the river in a relatively clean state. With remote control, the operator is reportedly getting a “first-person view” - thanks to the camera mounted on the boat. According to the portal Engadget, Good Ship IKEA boats are currently used in the Deptford Creek area (the confluence of Ravensborn in the Thames) in south-east London; It is noted that Ikea - as part of an educational initiative - provides people with the opportunity to steer boats. Upon completion, the company plans to donate the boats to the environmental charity Hubbub. Specialists from the University of Manchester in the UK today presented a very interesting scientific project that promises the birth of a conceptually new type of technology that can capture both solar and wind energy. This project was embodied in the format of an unusual flag, which only seems quite ordinary from the outside, except for the fact that its tail is firmly attached to special construction equipment, and, on the contrary, it moves freely under the action of the wind, which distinguishes it from the usual flag. In all this, the action hides a really simple, but at the same time brilliant concept of using photovolt cells. These photovoltaic cells are special energy mini-warehouses that are formed as a result of the connection of special polymers and inverted strips of piezoelectric materials. Thus, when a test sample of such an energy flag swings its area under the action of the wind, it acts with its tail on these same cells, causing work them. Being subject to the action of the wind and the movement of the flag surface, they thereby begin to efficiently collect energy from wind and sunlight, thereby uniting their energy potential for the most varied subsequent application formats. In this way, the development specialists clearly demonstrated and proved the possibility of building such a complex energy structure, which has really remarkable potential to energize entire networks of connected devices - and in the future, it may be about something more complex and voluminous, for example, to provide the whole house with such combined energy. Be that as it may, so far Manchester specialists continue to explore the piezoelectric properties of the materials used in the construction of the flag, thereby striving to establish maximum and minimum thresholds for third-party influence on them. If they succeed in effectively influencing the degree of collection of solar and wind energy, then this very future we are talking about will approach even more. Artificial intelligence has learned to generate the faces of people who do not exist. 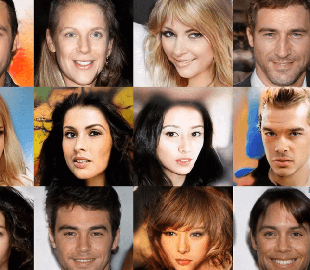 A little more than a year ago, Nvidia introduced a generative-adversary network capable of generating photographs of non-existent people. And if at that time this technology was considered ultramodern, then now it can be tested in the smartphone browser on the site thispersondoesnotexist.com, reports The Next Web. The site generates faces every few seconds. It is possible to refresh the page without stopping, and each time the algorithm will produce a unique realistic image, although sometimes its “outstanding” flaws are easily noticeable with the naked eye. Generation-competitive networks, the concept of which was proposed by the researcher Google Ian Goodfellow, are a combination of two neural networks. One of them (the generator) is learning to create something - in this case, human faces, and the second (discriminator) is trying to determine the authenticity of the image. The process continues until the first network learns to “cheat” the second, and when this happens, the developer checks the result and, if necessary, corrects the algorithms. Nvidia researchers have not just implemented their algorithm in the form of a somewhat strange website. According to them, they also redesigned the architecture of the generator in a way that allows better control of the synthesis process. India plans to create its "sovereign Internet"
The government of the “world's largest democracy” has decided that the Internet is too free. And now she plans to introduce new rules for content removal, comparable in severity to the Great Chinese Firewall. The Indian government began a “race against time” in an attempt to approve new and extremely tough rules for regulating the Internet before the election moratorium. If it works, it will turn the Internet in India into something like the current Chinese or proposed Russian “sovereign” version of the network. The essence of the proposals tells the New York Times. The set of measures was published for public comment - and drew criticism from many activists in a country that is commonly called the world's largest democracy. Measures can be combined into three blocks. First, the government requires Facebook, Google, Twitter, and TikTok to remove posts and videos that do not comply with local laws, violate privacy, are hateful or misleading. The second part is the installation of automatic traffic monitoring devices by providers that will allow Indians to be isolated from “illegal information”. The third resonant requirement is to reduce message encryption standards in instant messengers so that the authorities can track the sender. This is an echo of last year’s scandal around the country’s most popular messenger WhatsApp. Then false messages replicated in chat rooms led to several instances of lynching and beating up innocent people. The public comment period of the initiative expired on Friday night, so Prime Minister Narendra Modi can approve it at any time. Critics argue that such an approach puts India on a par with authoritarian states like China and Russia. The NYT, however, indicates that more than fifty states, including the European Union, have more or less accepted the restrictions on the freedom of dissemination of information. And one of the toughest legislation recently passed in Australia. However, if the model is implemented in India, this could be the “beginning of the end” of the unified Internet as a global network, which half of the world's inhabitants have access to. Last fall, India restricted the use of a universal biometric identification system, which critics called another step towards a police state.